Let’s be honest. Random record discoveries are exciting, and stories are hard to write. So it can be very tempting to get stuck in the research and leave the storytelling for someone else. Nor are we all natural writers. Some people can tap out hundreds of words in half an hour or so, while it’s a much slower process for many others. I’m in the second camp for sure. For me, writing is always a struggle, no matter how many tips I follow. So my trick is to let the research component do as much of the storytelling as possible. Sounds too good to be true, right? I promise it’s not, pinky swear. When you don’t know what to write, answer a question. 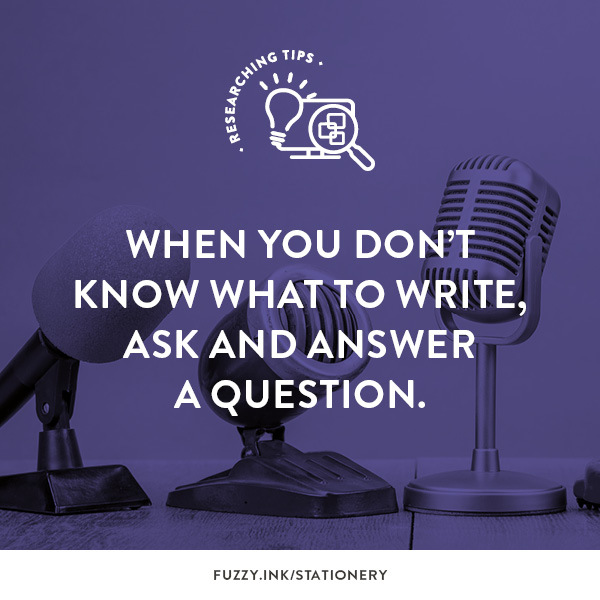 The trick is to make sure you capture the answers as you research. 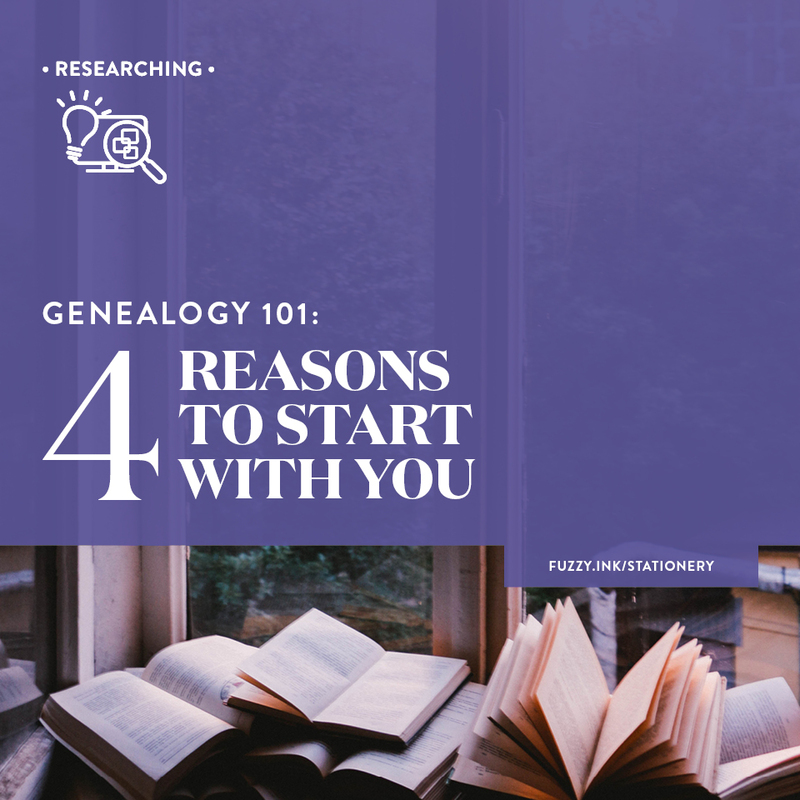 After all, genealogy is just finding the answers to the thousands of questions you have about your ancestors. So, as you make a discovery, write out the answer. That sentence or paragraph is a piece of the overall story. 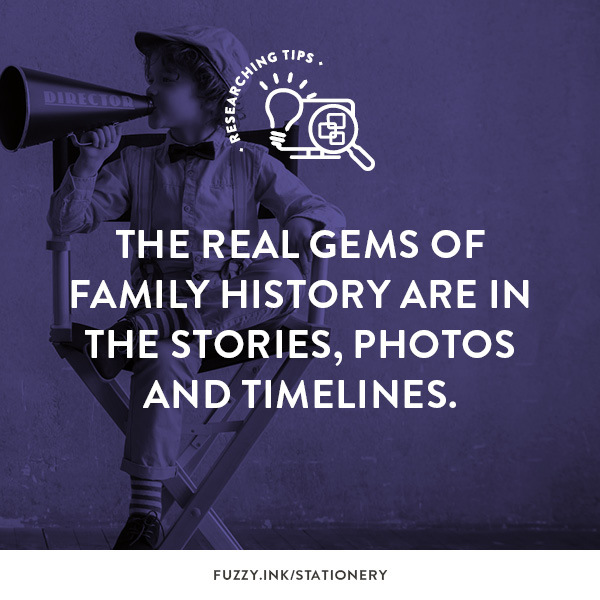 That way, when you are ready to write your family history you already have a rough first draft. Of course, this prompts many other questions, but I now have that first sentence to tell part of his story. All I have to do now is add to it. The best way to practice this method is to start with you. After all, it’s the topic you know the most about, right? 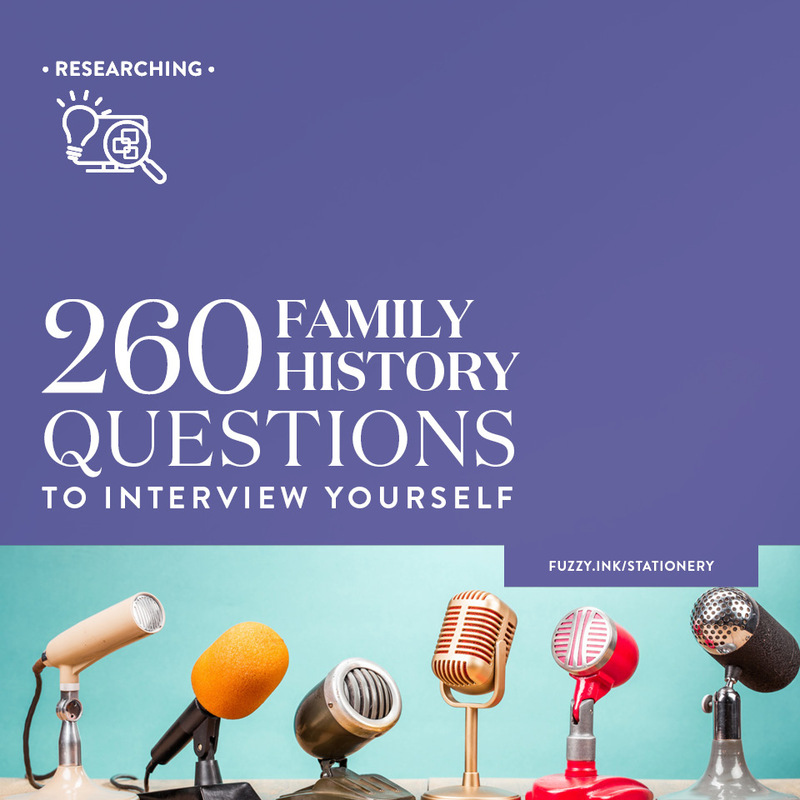 To help you out I’m sharing the top 260 questions that I use in my family history research. I’ve answered these myself and asked many of these when interviewing distant (and not-so-distant) relatives. Either write your response or get creative and create an audio or video recording. Share the story behind your name. Did you like your name growing up? Do you like it now? What was your nickname growing up? Do people still call you that today? Who gave your childhood nickname? What is the story behind it? What other nicknames have you had? Share the story behind each of those names. Which nickname is your favourite? Who else in your family shares the same name as you? What is your relationship to you? Share the story of how and when your parents met. The Engagement: When and where did your parents get engaged? How old were they? The Wedding: When and where did your parents get married? How old were they? Who gave the bride away? Share your favourite photo of your parents at their wedding. Who were the attendants/witnesses for your parents’ at their wedding? Where was their wedding reception held? Who made the wedding cake? How many guests did they have? Who made the wedding dress? Share a story you’ve heard about your parents’ wedding day. Did your parents have a honeymoon? Where did they go? Where did your parents live after they married/met? How long did they live there? Did you ever live there too? How many years have your parents been married? What pet names/endearments did your parents’ have for each other? Answer the questions below separately for your Mum and Dad. So, you’ll have two sets of answers (Mum and Dad). Share a story you’ve heard about your mother/father’s name. Did your mother/father have a nickname? What did her/his siblings or parents call her/him? What did you call your Mother/Father? Where was your mother/father born? Whereabouts did she/he grow up? If your mother/father emigrated, when and why did she/he move here? What did your Mum/Dad look like (e.g. height and build?)? Do you know her/him eye colour? How many siblings did she/he have? Name them in order of oldest to youngest. Where did she/he go to school? What was your Mum/Dad’s first job? How much did she/he get paid? What other jobs did she/he have during her/his working life? Did she/he ever serve in the military? Which service and what rank did she/he achieve? Did she/he ever receive awards or commendation for anything she produced? Share what you know about the awards. Who were your Mum/Dad’s closest friends? What did you call them? What did you admire most about your Mother/Father? Name your siblings oldest to youngest. Where do you fit in? Which sibling were you closest too when growing up? Which sibling are you closest to today? Do your siblings have nicknames? What is the name and story behind it? Growing up, did you a room with one of your siblings? Which one? What is your favourite memory of sharing a room? Which sibling was the most mischievous? Share a story about something they did. Share your favourite photo of you with your siblings. Share your favourite memory about each of your siblings. 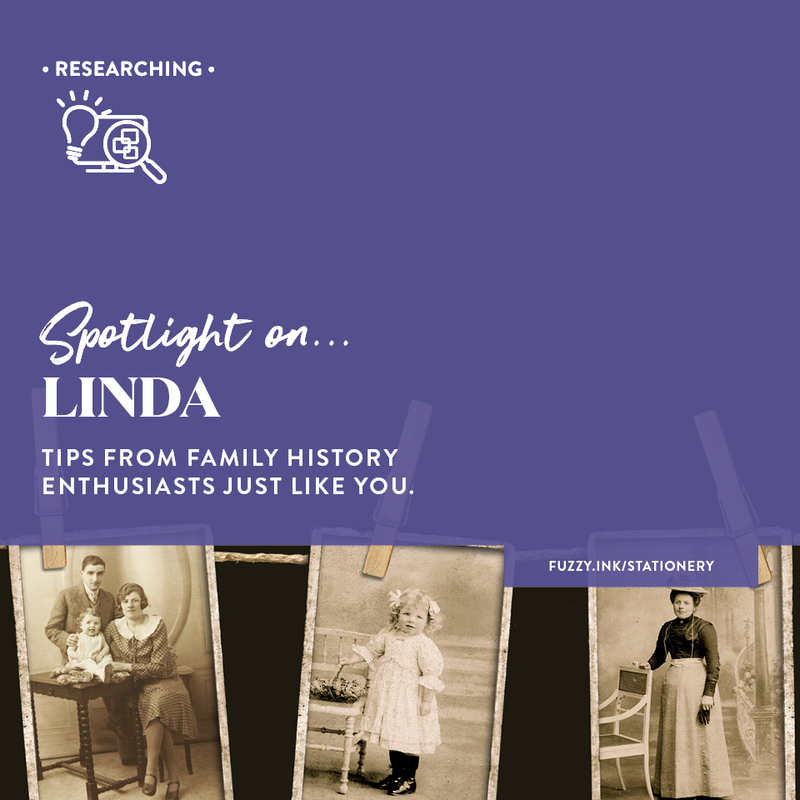 Which of your grandparents have you met (inc. great-grandparents)? Do you have anything mementos that belonged to one of your grandparents? What is it? Did you know your Mum/Dad’s parents? Share your favourite memory of your grandparents. Share a story that you’ve heard about their wedding day. Answer these questions (64 to 80) about each of your grandparents, whether you met them or not. So, you’ll have four sets of answers (Mum’s mum, Mum’s Dad, Dad’s Mum and Dad’s Dad). You can also use these for great-grandparents if you have memories of them. What did you call your grandmother/grandfather? Share a story you’ve heard about your grandmother/grandfather’s name. Whereabouts did he/she grow up? How many siblings did he/she have? List them in order of oldest to youngest. Which of their siblings have you met? If your grandmother/grandfather emigrated, what inspired her to move? Describe your grandparent, either as you knew them or from photos you’ve seen. Share your favourite memory of your grandmother/grandfather. Either yours or a story you’ve heard. What occupations did he/she have during his/her working life? Did he/she ever serve in the military? Which service? What years did he/she serve and what rank did he/she achieve? Did your grandparent serve in any war? Which one and where were they located? Were they awarded any medals or military honours for their service? Where did he/she die? How old were you? Do you have a favourite Aunt or Uncle? Have you met all of your Aunts and Uncle? What do you remember the most about the Aunts and Uncles you’ve met? Share your most memorable moments with your Aunts and Uncles. Have you met them all of your first cousins? Do you still stay in touch? Which is your favourite family photo taken when you were growing up. What do you love about it? Growing up, did food mostly come from the garden or the store? What was your favourite meal growing up? Do you remember the last time you had it? Who was the better cook, your Mum or Dad? What were birthday and holiday celebrations like growing up? Which holiday was your favourite? What did you like about it? Do you still follow any of the holiday traditions from your childhood? Every generation experiences fads (e.g. fashion, music, dancing etc.). Which fads can you remember from your youth? Where did your family go on vacations? Which was your favourite (or the most memorable) family vacation? Which was the first film you saw at a cinema or drive-in? What was it like going to the cinema or drive-in for the first time? Do you remember the first book you read? What was it? What story do your Mum or older siblings tell about your birth? Did you have a favourite toy? Who gave it to you? Do you still have it? Share a photo of you as a baby. Where was your childhood home? Did you share a room or have one of your own? Which sibling/s was your roommate? Other than homework, what daily or weekly chores did you have as a child? Which chore did you hate doing? What would you do to avoid it? What were your favorite toys? Do you still have any of them? What were some of your favorite childhood games. Did you have a childhood bedtime? Do you remember what it was? Did your Mum or Dad ever read you and your siblings a bedtime story? Do you remember any of those stories? Share a favourite memory from your childhood. Share a photo of you as a child. Did you have a part-time job? Where was it? Do you remember how much it paid? Who was your favourite singer or band? Did you ever see them perform live? Which was the first concert that you went too? When and where was that? What was the first record/cassette/cd that you purchased? Were you ever one of the dancers for a music show? Which show? In high school, how did you typically spend evenings and weekends? As a teenager, did you have a curfew? What was it? What was your first car? Is there a photo? Share a photo of you from these years. What did you wear on your first ever day of school? Is there a photo? What do you remember about your last ever day of school? Is there a photo? Name all of the schools that you attended. Which school was your favourite? What is the most memorable thing about your school years? Which sports teams where you on? What was your greatest achievement during your school years? Are you still friends with anyone you knew in school? Which university or college did you attend? What did you study at college? Which qualification did you achieve? Have you done additional study since leaving college/university? What did you study? Which year did you start primary/secondary school? How old were during your first year of primary/secondary school? Who was your best friend in primary/secondary school? Are you still friends today? When you were a kid, what did you want to be when you grew up? Did it happen? How many places have you worked? Which was your favourite place to work? Was your occupation something you ‘fell into’ or did you strategically work towards that career? If the latter, what made you choose that occupation? Are you or have you been self-employed/had your own business? What was the business? Are you still friends with anyone you met through any of your jobs? Have you ever served on committees for organisations or the local council? Share a favourite memory from each job you’ve had during your working life. Where was your first job? What was your role there? Do you remember how much you were paid? How long did you stay at that first job? What do you remember the most about that job? Why did you choose those organisations? How did volunteering make you feel? Share a story about something significant from your volunteer work. Did you serve in the military? Which service? What rank did you achieve? Have you received any medals/awards/commendations? Share your favourite memory from your military service. What is the funniest story you have from your dating life? How old were you the first time you went on a date? Did they meet your parents before you went out? Where did you go on that date? Do you have pet names/terms of endearment for each other? What are they? How long did you know each other before getting engaged? Share your memory of how the proposal happened. Where was the wedding reception held? Who made your wedding cake? What type of cake was it? Share a memorable moment about your wedding. Share your favourite photo of your wedding. Was there a honeymoon? Where did you go? Where did your spouse/significant other grow up? How many siblings does your spouse/significant other have? Where was your first home together? How long did you live there? Share your favourite memory about finding your first family home. What are their names? List them in order of oldest to youngest. Why those names? Share the story behind each name. Do any of them share a room with a sibling? Who shares with who? Which card or board games are family favourites? Answer these questions (202 to 209) for each of your children. Other than homework, what daily or weekly chores does he/she have to do? Which chore do they have doing? What do they do to avoid it? Share your favourite story of your son/daughter. Which towns have you lived in throughout your life? Where was your favourite place to live? What made it special? Did you share with friends or rent an apartment by yourself? Which city was it in? How much was the rent on that first place? What year was it? Share your favourite memory from living in that place. What age were you when you purchased a house/apartment? Which city was it in? What did you love about that house/apartment? What did you hate? Have you lived in other countries? Which ones? Share a favourite story from each country that you’ve lived in. Where else would you like to live but haven’t had the opportunity? Which country was the first stamp in your passport? How many countries have you spent time in? Have you ever been on a cruise? Where did go? Do you prefer hotels, caravans or camping? Have you ever traveled by yourself or always with others? What was your most memorable vacation of all time? Where was it? Who was there? Which places have been your favourite to visit? Which place were your least favourite to visit? Where have you been that you’d like to revisit? Share a story about the worst experience you had while traveling? Have you ever been a part of an audience for a TV show? Which show? Where you a member of the local library growing up or throughout your life? Do you have a favourite book? What is it? Do you remember when you first read your favourite book? Who are some of your other favourite authors or books? Have you ever been to a drive-in? What do you remember about it? Did you ever have a crush on a movie star or musician? Who was it? Do you have a favourite film? What is it? Do you have a favourite flower? What is it? Are you a sports fan? What sport and which teams do you follow? How many and what types of animals have you had as pets? Was there a favourite pet? Share a favourite memory about one of your pets. Have you won any awards for anything produced from your hobbies? When did you discover that you were talented at that hobby? Name five to ten people who have influenced you throughout your life. Share a story about how each of those people influenced you. Share a story about what you remember about each event. Has anyone in your family patented an invention? What was it? Do you have any politicians, sports stars or celebrities in your family? Name names! Have you ever had your photo in the newspaper? What was it for? You can meet one of your ancestors and get the answer to one question. Who is the ancestor and what is the question? When you aren’t sure how to start telling a story, ask and answer a question. I find it’s the quickest way to work out what you know and want to say. Like all other skills, writing gets easier the more that you do it. So, practice by answering questions about yourself. You’ll find your writing style as well as create an intriguing read for your descendants. 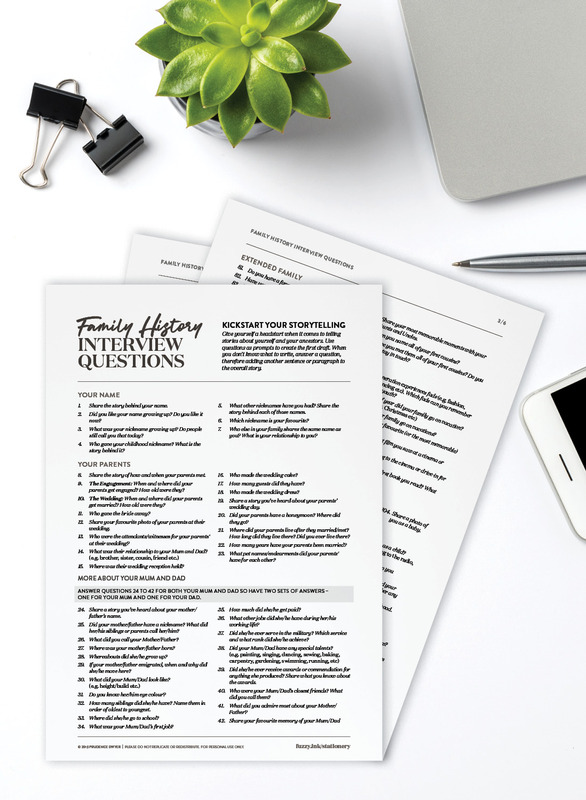 Don’t forget to snag the printable PDF with the full list of questions. Then cross off the questions as you answer them, or even add new ones that you think. Are there questions that I missed? Share your thoughts in the comments below so we can all add them to our lists! Unlock your stories through an interview with yourself. 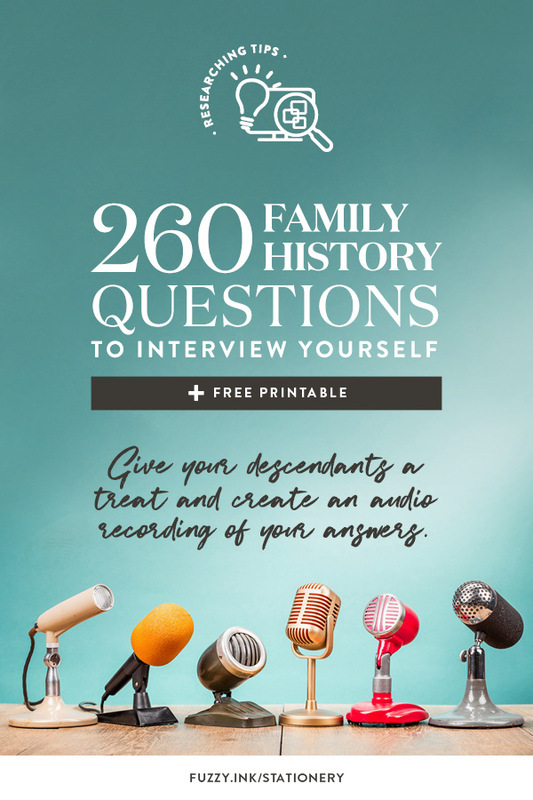 For a head start on telling your story, snag the FREE Printable PDF of 260 Family History Questions. 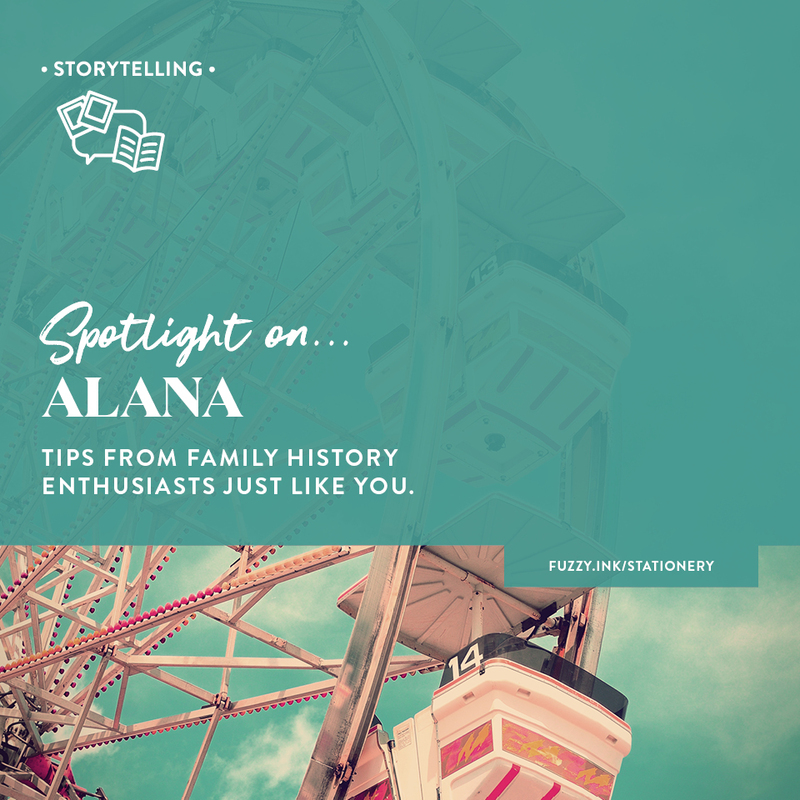 Then tackle writing your family history by asking (and answering) one question at a time.